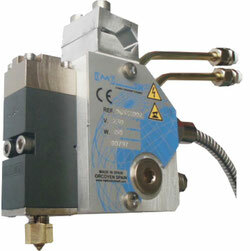 The ME Gun series are a high speed and applicator used in packaging and graphics applications. The ME Guns are “air open and air closed” and use the ME gun module. These applicators can be used with general packaging grade, PSA Pressure sensitive and Fugitive adhesive at temperatures from 93°C(200°F) up to 190°C(375°F). These guns are compatible with Nordson Sure-Bead and Solid Blue B gun series. The ME Guns can be configured in various spacing configurations for any required application. Each ME Gun is configured with a 220-240VAC heater cartridge. The standard heater OD is 1/2”. The ME Guns come standard with a clamp for 1/2” round bar or hex bar stock. There are 3/8”round bar bracket clamps available and can be purchased separately. If additional brackets are required, please see the brackets section. Most ME Guns are fitted with a 4-way solenoid and pre-plumbed from the factory. The solenoids are 24VDC and can be fired from any PLC and/or most existing pattern controls. They require compressed air at a pressure of at least 60PSI. Gun configurations having 4 or more modules will require greater a higher volume of air as well as a higher pressure base no less than 80PSI. For any applicator with more than 4 modules, it’s recommended that 3/8” or 10mm air line is used to supply the compressed air. All air ports are 1/8” NPT. The ME Guns also offer various activation configurations for independent air porting. Most independent air configurations come with QD fittings to allow for easy installation.modules, a blanking plate must be ordered to fill the open spot. If the system requires more than 4 of the control modules, a second VCX unit is required. Systems that require a second VCX will also require one of the secondary system stands.